As followers of Jesus, we have been grafted into Abraham’s family tree and receive the same blessings God promised him (Romans 11:17). We are God’s children, and everything He has belongs to us (Galatians 4:7). God will certainly supply all your needs from his glorious riches, which have been given to us in Christ Jesus (Philippians 4:19). He is Jehovah-Jireh, the God who provides (Genesis 22:14). 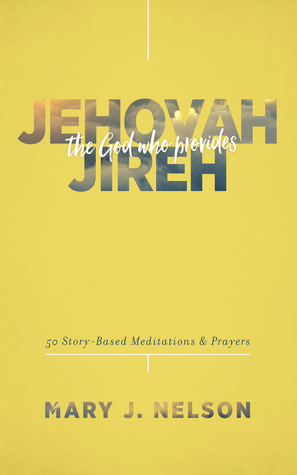 If you're in need of God's provision, Mary J. Nelson's Jehovah-Jireh will comfort, encourage, and inspire you on a journey of prayer and devotion. Nelson shares the Word without compromise, releases hope, and focuses on the heavenly Father's infinite love and grace. Sixty story-based meditations and stories, plus passionate prayers for provision, will guide you as you pray the scriptures into your personal life, drawing you ever closer to the Ultimate Provider, while compelling true stories—both biblical and modern—lead you to discover that He is all you'll ever need. I love learning the names of God, so I was super excited to have the opportunity to review Jehovah Jireh the God Who Provides by Mary J. Nelson. This 60 day devotional is very encouraging, especially if you are looking for a new job, have lost your job or are in a place where you are trusting the almighty for provision. Have you ever known that God is faithful, but you wondered how He would show up or could you really trust Him? He is the provider and will provide every need you could ever want. In next 60 days, this book will help you trust the God of the universe for thighs that you didn't think were possible. It will help you focus on God and not your earthly problems. It will help you draw closer to Him and you will discover He is all you need. I love the prayers after each devotional. They are very helpful and I find them to help me be super mindful throughout the day when I am facing a situation to keep my eyes fixed on that prayer that I said earlier in the morning on that topic. Thank you to the publisher for providing me a complimentary copy. A positive review was not required. I give this devotional 5/5 stars. Mary J. Nelson is an author, speaker, and Pastor of Prayer. She has a passion for helping people encounter God and His goodness in the midst of trials and be empowered and set free to live out their destiny. She emerged from a breast cancer diagnosis in 1999 eager to share how God restored and transformed her life. Her deepest desire is to give away what she has freely received. Mary is the author of Grace for Each Hour: Through the Breast Cancer Journey (Bethany House, 2005), Hope for Tough Times (Revell, 2009; Soterion 2013), and Peace for Each Hour (Comfort Publishing 2012). Her two latest books will be released by Shiloh Run Press in 2016: Jehovah-Rapha: The God Who Heals, and Praying for the Cure: A Powerful Prayer Guide for Comfort and Healing from Cancer. Her books inspire those suffering from cancer, health crisis, broken relationships, unemployment, financial failure, or devastating loss by helping them draw close to the heart of God. She founded and leads the Pray for the Cure cancer healing ministry at Hosanna! Church in Lakeville, MN where she also serves as a leader in the Healing Prayer and Sozo inner healing ministry. She and her husband, Howie, have two adult children and two grandchildren, and make their home in the Minneapolis-St. Paul area. They enjoy spending time with family, traveling, motorcycling, reading, and serving together as prayer leaders in their local church.